How does the insula provide information about internal bodily states? The insula is involved with the representation of internal bodily states. It helps process sensory information from inside our bodies, for example butterflies in our stomach or cramps in our intestines. More specifically it has been associated with the processing of aversive food tastes and the related experience of disgust. The insula is located on the inside of the cortex, surrounded by the temporal, frontal, and parietal lobes. Brain imaging studies have shown that this region is activated in many different emotional states. This is because sensory information about the physical state of the body plays a critical part in the subjective awareness of emotion. Try to remember the times when you have felt intensely happy, angry, or frightened. Do you recall the sensation of changes in muscle tension, energy level, heartbeat, etc? Can you imagine experiencing intense emotions without feeling these bodily changes? In sum, the amygdala and hypothalamus primarily provide emotional output—they activate the emotional responses. In contrast, the insula gives emotional input. It helps translate biological emotion into conscious feeling by giving us information about what our body is doing. Many mammal species are very social. 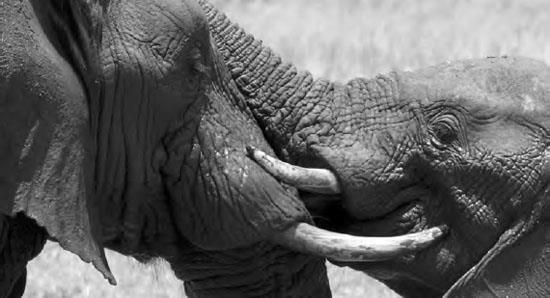 These elephants, for instance, are engaging in affectionate social behavior. Our emotions evolved in large part to help us negotiate the social world (iStock.com).